My 912 has 2 Bing carbs and I am installing a Grand Rapids Tech EIS. Included in this monitoring system is a carb temp probe. It is short and has a 1/4"x28 thread. Does anyone have a clue where I would put this on a Bing carburetor? I think it should be in the fuel stream after the butterfly. I don't see a place for it and I'm not going to start drilling holes. I asked the people at LEAF and they said to put it in the air box. Really? Yeah well I don't think so and I don't have an air box. Just 2 K&N air cleaners. Thanks. 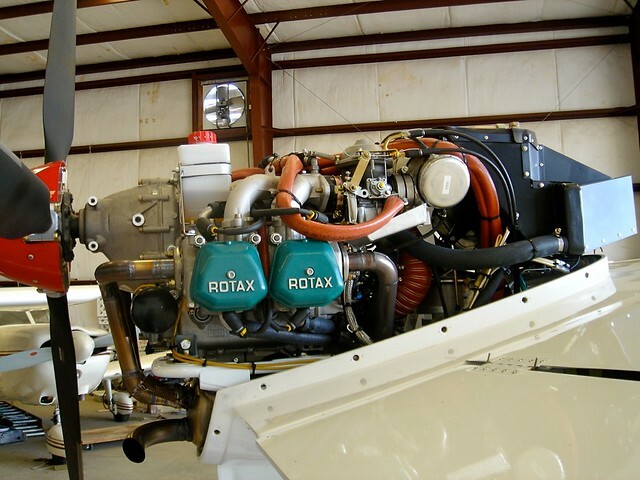 (1) unlike most Lycoming and Continental engines, the carbs in a Rotax are located above, not below, the cylinders. This tends to keep the carbs warm. (2) the Rotax uses two carbs, not one. Since the likelihood that both cabs would ice up at exactly the same rate is pretty much nil, the worst that can happen is that one carb ices up, the engine starts running on two cylinders, and it shakes enough to wake up even the soundest sleeping pilot. That reminds you to pull on full carb heat, curing the icing problem much faster than if you were staring at a temp gauge. Like Paul said it's kind of useless. It may have been designed originally for other carbs on different aircraft. It's most likely is a holdover from that. The variable throat carbs are more resistant to icing, but given the perfect storm scenario it could happen. You as an individual really don't need it with 2 K&N air filters under the cowl. Setups like this are always running with carb heat and running rich because you use the hot air under the cowl and not outside colder air that may also have more humidity. I have never in 20+ years seen a carb temp probe in a Rotax 912. Because of your air filter / engine setup it would be worthless for any meaningful infprmation. Kind of two overlapping threads ongoing. In 10 years and 500 hours I’ve never needed carb heat “in anger” in my Sky Arrow. Air flows right to left in the photo. Clearly the exhaust is not much help, even less so now that I’ve wrapped it. But note the location of the oil cooler and coolant radiator - seen to the right where the cowling’s air intake would be. Looks like the air flowing through them has both carbs getting air warmed by the radiators flowing over them. Again, every installation is different, so anyone’s results may vary. As far as one carb getting ice first, that sounds plausible to me. The slightest variance in float height - which affects mixture - and myriad tiny differences in air and/or fuel flow or the aforementioned airflow around the carb bodies may all affect which carb gets ice first, which leads to the roughness. In my one carb ice incident it was in a Cub with only one carb and I don’t recall any roughness, just a gradual reduction in rpm (details in the other thread). On my Seastar pusher configuration, both carbs are in direct airflow from outside air through the cowl openings. so they get no benefit what so ever from engine produced heat. If you stand in front of the aircraft, you can almost see the carburetors and air cleaners, one on each side. I have carb heat with a valve on the water supply. If I fly in weather that may produce carb icing, the heat is there if I need it. And it costs nothing in engine efficiency and does not use any electric current. I did a lot of research on this and as i see it, better safe than sorry, in my plane at least. There is more than one 912 that came down from carb ice I have found. Thanks for any answers guys. Yeah 2 things going at once here. Carb heat and tyemp probe. Oh well. I'll do better next time. To the guy who has never needed carb heat, Your in Georgia? It's pretty warm there. I'm in central Wisconsin and i fly when it's below freezing on occasion and sometimes when the temp and humidity are just right to form carb ice. And guess the carb temp and carb heat are kind of related. But they somehow got on the same page. I'll do better. By the way, I had a Challenger II I built for a while and it had a Rotax 503 on it and i had carb ice bring me down once and nearly a second time. Different engine but never again. don't like forced landings. chuckb01 wrote: To the guy who has never needed carb heat, Your in Georgia? It's pretty warm there. It's also extremely humid here, which is a larger factor than temperature in carb icing. For a Rotax 912, the biggest "danger zone" for carb icing seems to be high humidity and temps around 60°F, which we get in Georgia quite often. I think if anybody would be prone to carb icing, it would be us here is the wet southeast. In the 500 hours I've operated my 912ULS, I have had one event of engine roughness that *might* have been carb ice, or might have just been a carb sync issue. I assumed the latter, re-synced the carbs, and flew it again the same day and never had the problem again. Jim, will keep you posted. I did a lot of research and as I see it, a little carb heat from the water cooling system costs me nothing in performance and can do more good than harm. It's installed and has an on/off valve. No big deal. I was talking about a temp probe in this subject. Sorry about the switch but the two are related.